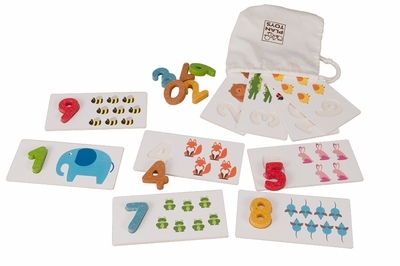 Plan Toys 5165 - Learn your numbers with Plan. Eleven wooden numbers (1-10, There are two number ones.) and ten animal cards with space on the back to write or copy the number. Helps to correlate the physical count of an item with the digit. Comes with a cotton storage bag. Made from rubber wood and printed with non-toxic soy ink. Cards are cardboard. Digit measures 2" tall.